How does one describe Journey, exactly? It's a videogame unlike any other, to the point where calling it a videogame doesn't quite feel right. One could call it an art game, but that would draw comparisons with infinitely less distinguished pieces of software. Whatever label you want to affix to thatgamecompany's latest creation, there's one description that absolutely everybody should be able to agree on. Journey is ... a journey. There is a story to Journey, a message to take away. What elements of this story will resonate and what message is ultimately gleaned depend on the individual, and may be quite unique. As in all titles developed by thatgamecompany, there is nothing truly explicit, nothing that cannot be interpreted in any number of ways. At the most basic level, you are a shrouded figure traversing the desert with the ultimate goal of reaching a mountain across the vast sandy wastes. Your interactions are minimal, as your main job is simply to move. Traditional stick movement gives you direct control over your entity, while Sixaxis motions manipulate the camera. Pressing the circle button causes the player character to emit a chime, and the button can be held down to make a more significant noise, generating a spherical field that emanates from the player. This aura can bring life to surrounding objects, causing them to perform special actions that will guide the player along the correct path. The creature (for want of a better word) wears a scarf that contains a unique power, allowing the player to fly into the air with a press of the X button. This flight only lasts as long as the glyphs printed on the scarf remain lit, and the glyphs' illumination naturally drains as the player remains airborne. The scarf can be recharged by touching fluttering strands of fabric, and it can be lengthened by collecting glowing symbols hidden throughout the desert. Simply describing these mechanics doesn't quite do their implementation justice. Nor would any summary of the unique cooperative elements accurately detail just how affecting one's interactions with another player can be. I found my partner in the middle of the desert, as he or she found me. 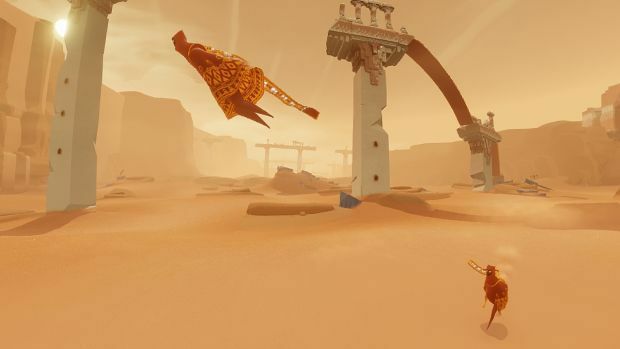 Journey's online co-op simply introduces two players at random shortly after the game begins. No names are exchanged for the duration of the partnership. The characters look identical. There is no way to truly communicate with the other person, but that person -- whoever it is -- shall become your best friend for the next two hours. My new friend had clearly been on this journey before. He or she was an expert guide, pointing out hidden symbols and leading me to secret spaces where mysterious murals could be uncovered. Rather quickly, I learned to follow when my partner chimed three times. I also learned how to keep close, as players recharge each other's scarves while touching. Cooperation has not been forced into Journey. Rather, the player takes it upon one's self to help out others. This was clearly somebody who had played Journey before, but had returned to the desert in order to guide others. Even with this potential, the two players don't truly work together in any meaningful sense of the word. They are not pulling levers to open doors for each other. They're not giving each other a leg up to climb walls. While the recharging of scarves can save a little time, it's not necessary to complete the journey, since fluttering fabric is plentiful. Despite the lack of interaction and the dearth of true cooperative opportunities, I felt more connected to my traveling companion than I did to anybody else I've ever played a game with, as the thoroughly impersonal touch causes players to latch onto each other. The desert is expansive and can threaten to grow quite lonely. For all intents and purposes, Journey is a forsaking, solo adventure, but it's one you get to share with another person, and you feel worlds apart when you go your separate ways. This is what Journey's co-op truly means. Two people walking the same path, and simply appreciating each other's company. At times, however, you'll wish you could say something. When running through dunes and chasing magic carpets; when sliding through a sunken city; when looking through a crack in a mountain as the sunlight pours in -- there are so many achingly beautiful moments packed into such a short experience that you'll want to call out to your partner and say, "It's wonderful, isn't it?" You'll want to say it, but ultimately, nobody needs to. Chances are almost certain that you're both thinking the same thing. Through subtle animations and a gorgeous blend of colors, Journey's world is a joy to be a part of, a world that can genuinely etch a smile onto the player's face. 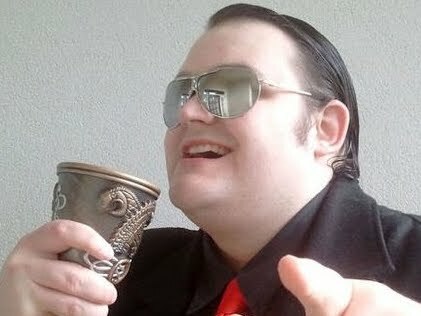 As for the music that weaves itself throughout everything, I have only the highest praise. 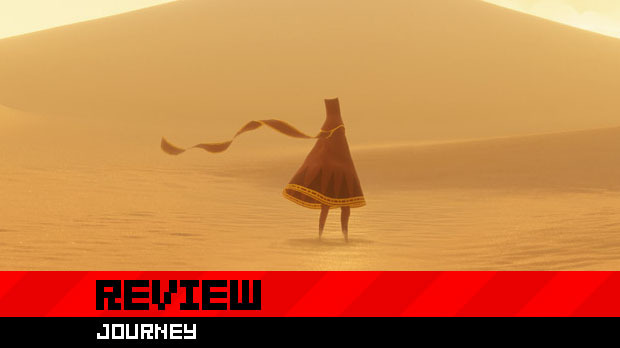 Journey's score is sublime, complementing the often breathtaking visual splendor with perfection. 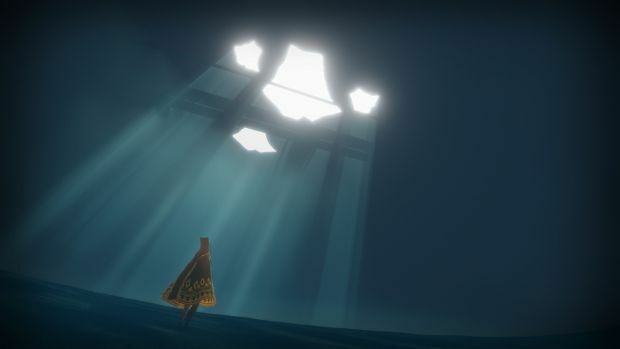 I would love to further describe this alluring marriage of interaction, sight, and sound, but to relate any one example would be to take away the joy of discovering it yourself, and Journey is a game best walked into without knowing quite what to expect. Journey will take two or three hours to complete, and for $14.99 there are doubtless those who will feel cheated. Those who fall in love with what this odyssey has to offer, however, will find that the memories are more than worth the entry fee, and will likely be tempted to play through at least once more. Besides which, this is a game designed to be played in one sitting, from beginning to end, in order to appreciate the full scope of one's pilgrimage and the wonderful way in which it escalates from humble beginning to rousing end. This is not a game for those who view length as the primary measure of a product's entertainment value. Perhaps a little more could have been added to Journey, and I certainly would have loved more interaction with such an absorbing and intriguing world. Simply walking and gliding certainly can make a player focus solely on the atmosphere, but it still feels a little indirect and sometimes alienating. Nevertheless, these minor gripes serve to make it all the more impressive when one finally concludes the adventure and realizes how emotionally rewarding it was. 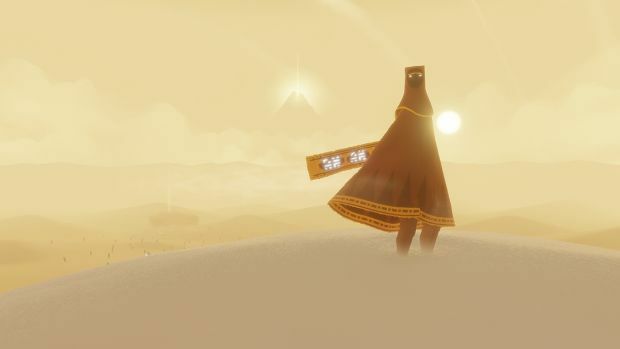 For a game that does so little, Journey sure manages to accomplish a lot. Its greatest achievement, however, is showing the world exactly how to make a piece of interactive art that is both compelling and fun, without compromising any one element. So many self-styled "art games" feel that in order to evoke a feeling, one must confuse, irritate, or even totally disregard the player. 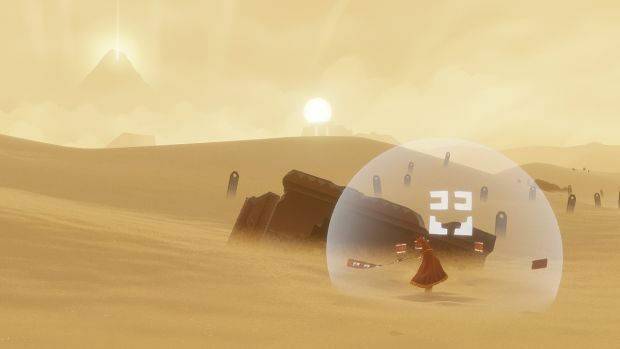 Journey is a defiant bridge between art and game, managing to emotionally connect without being cloying, and succeeding in being mysterious without becoming pretentiously vague and obfuscating. Journey's interactive, visual, and aural elements work together, rather than fight with each other, in order to provide a flowing, seamless, influential, and utterly exhilarating experience. This is interactive art. This is how it's done.